It's all happening on the silver screen. 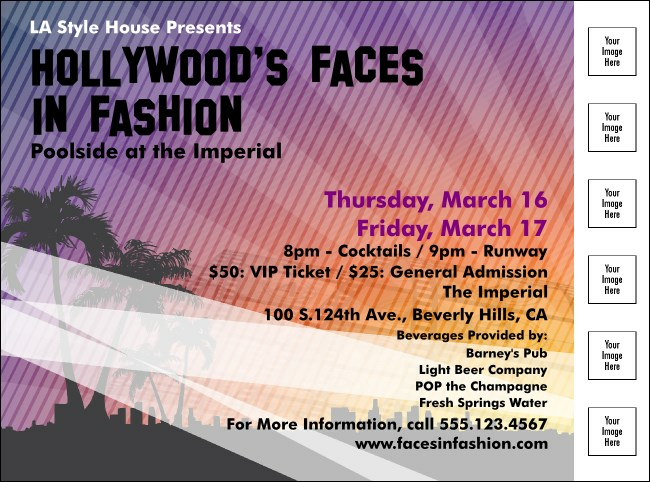 Get the word out with the Hollywood Flyer, for film festivals and other Hollywood-themed events. Featuring the enchanting skyline of Hollywood, complete with palm trees and a hazy rainbow sunset, this flyer template, which matches our Hollywood Event Kit, delivers the magic of Hollywood right to your hands. Find just what you want in TicketPrinting.com's huge online gallery of designs.